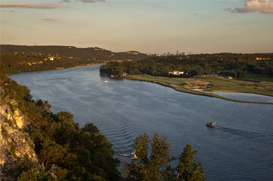 Waterfront homes are some of the most popular properties in Austin. The Mansfield Dam divides the Colorado River into two bodies of water—Lake Travis and Lake Austin—and the surrounding land into high-ticket residences. Lake Travis is the bigger of the two, and offers more newly developed, one-family real estate. Lake Austin, on the other hand is known for many condo communities—including Apache Shores, Bella Lago, Greenshores, The Courtyard and Laguna Loma. Both lakes offer breathtaking views and a swimming good time. Properties on either lake are also close enough to downtown to be a part-time city slicker for those interested. Residences on Lady Bird Lake tend to be very high end due to their proximity to downtown and many have fantastic views of this urban lake.